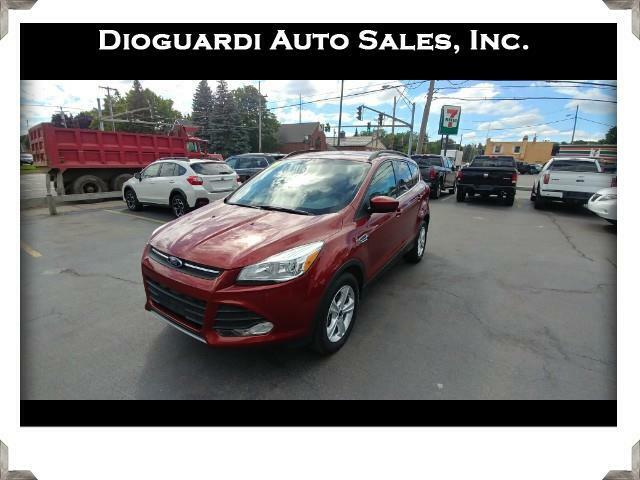 Used 2016 Ford Escape SE 4WD for Sale in Rochester NY 14609 Dioguardi Auto Sales, Inc. The Ford Escape is an entry-level compact crossover SUV that seats five and comes in three trim levels. Amply outfitted in the standard model, you’ll get: 17” steel wheels, the MyKey control system for parents, remote entry, tilt and telescope steering wheel, 60/40-split folding rear bench, parking camera, voice command, Bluetooth/iPod/USB integration and a six-speaker audio system. Upper trim levels can add roof rails, privacy glass in the rear, parking sensors in the rear, fog lamps, automated headlamps, powered front seating, 110-volt plug outlet, 8” touchscreen that offers the MyFordTouch interface, upgraded 10-speaker Sony audio system, premium leather upholstery, remote start, powered rear liftgate, GPS, xenon headlamps, automated parallel-parking system, collision mitigation system, panoramic sunroof, 19” wheels and more. Powering the Escape is an upgradable 2.5-liter four-cylinder engine that’s rated at 168 horsepower and 170 pound-feet of torque.